CONVICTED MURDERER OSCAR Pistorius says his late girlfriend Reeva Steenkamp wouldn’t want him to waste his life behind bars for killing her. The South African former Paralympian athlete, who is awaiting sentencing for murdering Steenkamp in 2013, told British broadcaster ITV that he did not kill his partner intentionally. “I don’t want to go back to jail. I don’t want to have to waste my life sitting there,” he said in footage released ahead of his first television interview, which will air on Friday. “If I was afforded the opportunity of redemption, I would like to help the less fortunate,” he said. In a case that shocked the world, Pistorius, 29, shot Steenkamp in the early hours of Valentine’s Day 2013, claiming he mistook her for a burglar when he fired four times through the door of his bedroom toilet. He was found guilty of murder in March, after spending a year behind bars on his earlier conviction of the lesser crime of culpable homicide – the equivalent of manslaughter. The Supreme Court of Appeal ruled that Pistorius was guilty of murder, irrespective of who was behind the door when he opened fire with a high-calibre pistol he kept under his bed. “Reeva was a fantastic person, but if (people believe) that I took her life intentionally, which has not been found, then it’s a very sad thing,” Pistorius said. Last week, Pistorius was criticised by prosecution lawyers for apparently being too ill and depressed to face cross-examination at his sentencing hearing yet able to give the TV interview. “I can smell the blood. I can feel the warmness of it on my hands. I understand the pain people feel, that loved her and miss her. I feel that same pain. I feel that same hate for myself.”I look back and I think, I always think – how did this possibly happen? Saying he believed an intruder was in the house and seconds from their bedroom, Pistorius said an “instant fear” drove him to grab his gun and walk on his stumps towards the bathroom. “All of a sudden I hear a noise at the toilet. I presumed it was the toilet door opening and before I knew it I’d fired four shots. I opened the toilet door and immediately when I saw Reeva she was over the toilet. I knew that she was dead. And I went down on my knees and pulled her onto me. At the sentencing hearing and in the interview, Pistorius walked unsteadily on his stumps to demonstrate his physical vulnerability at the moment he says he thought the couple were threatened by an intruder. The double amputee, who is currently on bail, wept during the interview, holding his head in his hands and telling how he was verbally abused by a shopper when he went to buy groceries recently. In court last week, Steenkamp’s father Barry broke down during his testimony as he called for Pistorius to “pay for his crime” of murdering Reeva, a model and law graduate. Pistorius, who competed in the 2012 Olympics, will be sentenced in the High Court in Pretoria on 6 July. Email “Reeva wouldn't want me to waste my life behind bars, Oscar Pistorius says”. 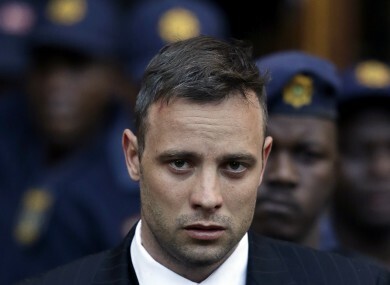 Feedback on “Reeva wouldn't want me to waste my life behind bars, Oscar Pistorius says”.